Bill, aka Thorzul, held his "Return of El Cheapo" card break. There were several packs involved and I put my bid in for the Indians. I knew there was a chance I would pull a goose egg, but that's the chance one takes with a break like this. I did not, however, pull a zero out of the hat! In fact, it seems I managed to a handful of "hits" (such as they are often referred). 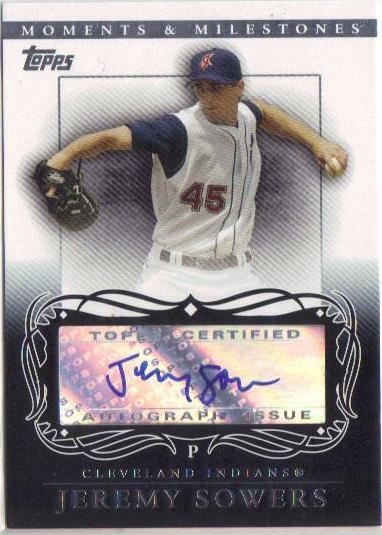 Digression: I am an avid Indians card collector - ANY Tribe cards I get are HITS in my book! How about a Dennis Martinez SP Legendary Cuts Glory Days (036/399) and an Exponential^2 CC Sabathia! Holy Smokin Stack of Cheapo, Batman! You will get no complaints from the peanut gallery (er, yet still a different card blog) here, folks! These are great and well worth the price of admission! Thanks to Thorzul, who really does rule! Or does he SET the rules? You know, it just occurred to me that the proper inflection dictates whether he is the ruler ot if he has his own set of rules (Thorzul Rules). I digress (often). Wow ! Nice cards ! !